I was going to save this write up for the end of the week, but I got too excited to share it with all of you, so I decided whatever, we need this kind of amazingness on TUESDAYS to give us a little more will to pursue our passions. ENJOY the read! Armed with an amazing ability to manage very, very demanding people, and more than her fair share of natural born charm, wit, and intelligence, Banker turned Bride's best friend, Lelian Chew, talks about turning those girl-hood dreams into full time reality - one that breathes life into the dreams of others. Sitting across from Lelian one sunny afternoon, I realized that she is one of those ladies that every girl wants to be, and every man wants to be with. This brilliant former banker is blessed with far more than her fair share of charm, wit and intelligence, not to mention incredibly good looks and a wardrobe TDF. She also has an incredible story to share – one that started behind the front desk of the hospitality industry, which evolved into the coveted role of banker to the top 1% of Asia’s HNW individuals, and finally led her back to her dream job of planning weddings that are – dare I say it – bold and beautiful. She was perhaps the best example of someone I knew who was pursuing her passions, using her talents, to create a purpose and a place for herself in an industry that was completely foreign to her. So I figured I’d feature her here, because really - who in their right mind leaves the ivory tower of G's PB for the unchartered (and gruelling) territories of wedding planning? Lelian does. Because behind all that aforementioned natural born charm, wit, and intelligence lies an incredible ability to manage very, very demanding people, and a burning desire to ensure perfection in everything she does. Who better to manage brides-to-be than a banker seasoned in managing the billionaire boys club? With that, she launched The Wedding Atelier (TWA) a boutique wedding and events planning agency that creates fantastical landscapes using florals, and offers brides a way to have the big day of their dreams. I guess the first question everyone has on their minds would be – why leave the cushy world of an extremely well-paid banking job? Banking was my first and only love for a long time. But there was always a little voice inside me wanting to seek out opportunities outside of this comfort zone. Two years ago, the bank transferred me from Singapore to Hong Kong and I think the new environment sparked off something in me. I decided to take a hiatus from work, partly to suss out my new city, partly to see what else is out there for me, and somehow all of this came to be. I was involved in every aspect of planning my wedding – from budgeting to vendor selection to floral design to food plating and really, anything you can think of! It was a great opportunity to breathe life into all those ideas I’d had in my head since I was a little girl. After my own wedding, I was so very fortunate to be involved in a number of spectacular weddings, which really helped to build up my experience and portfolio (and test the waters of the industry). The Wedding Atelier (TWA) was only launched after I was fully confident that my team could recreate the magic in every subsequent wedding we take on. And how did the skill set you developed translate across very vastly different industries? In my past life, I dealt with the most demanding of clients. Billionaires who gave me a minute on the phone while they wait for their transit flights. CEOs who called at 3am to find out why their US-listed company is trading up 2%. You learn to be well-prepared, highly organized and extremely resourceful. I can’t imagine these skill sets being irrelevant in any industry, but I think it’s particularly applicable to weddings as there are so many different pieces, and they’re all moving at the same time. With The Wedding Atelier (TWA), I still deal with the same type of clientele and they demand the same level of service from me, and sometimes more! Because there are few things more important to one than their own wedding day. As with my last job, I do a great amount of groundwork for the wedding couple, taking time to suss out their likes, dislikes, personalities, visions and more. I am obsessively organized – a trait I picked up in my past life, and my blackberry is a banker addiction I won’t be quitting anytime soon as that’s what brides want – 24/7 service. The other factor I have been very, very fortunate to have been able to bring over from my previous life is that The Wedding Atelier (TWA) has exclusive access to breath-taking private estates in many parts of Asia that are privately owned by my ex-banking clients. It’s wonderful to be able to offer brides locations that would otherwise be unattainable for their big day. You’ve created some of the most stunning set ups I have ever seen this side of the pacific – where do you get your seemingly endless inspiration from? Wedding trends are not dissimilar to fashion trends. Each season sees its showcase of colours, textures and themes and I definitely draw inspiration from all that. That being said, I also believe that every wedding designer needs to have a signature touch, almost like a trademark. I love using flowers to transform a space and believe TWA’s floral designs are our distinguishing factor. Flowers are not just a mere decorative element; in many instances they are carriers of message as different blooms tell different stories. Besides their visual appeal, flowers also have a natural fragrance so you evoke multiple senses at the same time. You would be surprised by how much the right floral set up can transform a space. I am also lucky to be able to collaborate with some of the best and most talented vendors in the world. They too are hard to get access too, but in a creative field like this, you want to work with the best of the best, and being able to draw on each other for inspiration and influence ensures that the good ideas are never, ever in short supply. 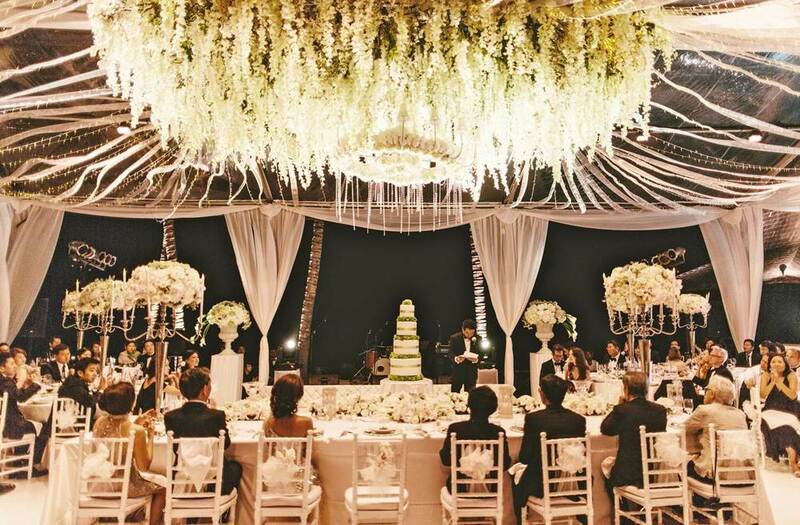 The concept of hiring a wedding planner seems to be taking off much slower out here in Asia, compared to the US. What type of couples should hire a wedding planner, and why is it a good idea? Yes, you’re absolutely right! I believe many couples in Asia still make the common mistake of assuming the venue coordinator or their bridal party can perform the role of a wedding planner. They fail to realize that the venue coordinator works for the venue and not for them. And unless someone in your bridal party is a professional event planner, they will be too distracted with socializing and phototaking (instagram!) to be focused on their task at hand. This leaves a lot of loose ends to brides, and the last thing you want is to be frazzled on your big day. The advice I give to all brides (friends, relatives, clients alike) is for them to leave the worrying to the professionals. From vendors, logistics, protocol to the smallest of design details, this expert has the skills and contacts necessary to make your day come together flawlessly. In addition, other than her traditionally defined role, a good wedding planner also takes on many other roles. I've acted as a mediator in tricky family situations, a fashion advisor to aid with gown selection and an etiquette consultant to coach on the dos and don'ts of a wedding. These are all hidden perks of hiring a wedding planner that many do not see. As someone with experience in planning and executing some of the most beautiful weddings I have ever laid eyes on, tell me, what is the most important thing that brides must remember on their big day? After months of planning and anticipation, the worst thing you can do is to have the day slip you by. I tell all my brides the same thing on their wedding day – s l o w d o w n and take in everything. It’s your big day, everything is tailored to your likes, everyone is present for you. The only thing you need to do is to savor each moment and start creating memories. Leave all the worrying to me. And finally, one piece of advice for would-be entrepreneurs? I’ve come to realise that there will never be a perfect time to make the move to start something new. You’ll always have a reason not to: the economy is not doing great, maybe I should not take on additional risk now; the economy is booming, it’ll be a waste if I don’t stick around for my next bonus. I say "Take that leap of faith now!" Use the positives to your advantage and work around the negatives. Things will never be easy, but being passionate and working very, very hard goes a tremendously long way. I know this has probably led the lot of you into thinking OMG SHE IS GETTING MARRIED! [No, I'm not] But if you are in the market for Event Planning Services, Design Services, or Day-Of Orchestration, I can't even begin to explain how perfect Lelian would be for the job. Check out the rest of the weddings she's had a hand in over on The Wedding Atelier.